Neuroepithelium stained for tight junction protein ZO1(white), phospho-histone H3 (cyan), and DAPI (blue). Cleft lip is a common orofacial birth defect that results from incomplete growth and fusion of facial processes. In this month’s issue, Hiroshi Kurosaka and colleagues uncover a critical link between WNT signaling and the sonic hedgehog (SHH) pathway in the development of cleft lip (1660). Their studies reveal that altered SHH signaling promotes the formation of cleft lip by antagonizing the canonical WNT pathway and reducing expression of interferon regulatory factor (IRF6). Citation Information: J Clin Invest. 2014;124(4):1421-1422. https://doi.org/10.1172/JCI75027. Citation Information: J Clin Invest. 2014;124(4):1423-1424. https://doi.org/10.1172/JCI75543. Citation Information: J Clin Invest. 2014;124(4):1425-1429. https://doi.org/10.1172/JCI75840. I would like to express my sincere appreciation to the American Society for Clinical Investigation and the Harrington Discovery Institute for the honor of being named the inaugural recipient of the Harrington Prize for Innovation in Medicine. I accept this distinction with a deep sense of gratitude and debt to my mentors, trainees, colleagues, collaborators, patients, and family. Moments of recognition such as this are rare, savored, and sustaining. They also invariably provoke personal reflection about what exactly is being recognized. If something innovative truly stands apart in my work, I have come to the conclusion that it relates less to the methods utilized to address questions and more to the questions I choose to ask, and when I ask them. Citation Information: J Clin Invest. 2014;124(4):1430-1438. https://doi.org/10.1172/JCI71029. Age-related macular degeneration (AMD) is a common cause of visual loss in the elderly, with increasing prevalence due to increasing life expectancy. While the introduction of anti-VEGF therapy has improved outcomes, there are still major unmet needs and gaps in the understanding of underlying biological processes. These include early, intermediate, and atrophic disease stages. Recent studies have assessed therapeutic approaches addressing various disease-associated pathways, including complement inhibitors. Drug-delivery aspects are also relevant, as many agents have to be administered repeatedly. Herein, relevant pathogenetic factors and underlying mechanisms as well as recent and potential therapeutic approaches are reviewed. Citation Information: J Clin Invest. 2014;124(4):1439-1445. https://doi.org/10.1172/JCI67226. Early demonstrations that mice could be tolerized to transplanted tissues with short courses of immunosuppressive therapy and that with regard to tolerance to self, CD4+FOXP3+ regulatory T cells (Tregs) appeared to play a critical role, have catalyzed strategies to harness FOXP3-dependent processes to control rejection in human transplantation. This review seeks to examine the scientific underpinning for this new approach to finesse immunosuppression. Citation Information: J Clin Invest. 2014;124(4):1446-1453. https://doi.org/10.1172/JCI72589. Citation Information: J Clin Invest. 2014;124(4):1458-1460. https://doi.org/10.1172/JCI75239. The metastatic spread of tumor epithelial cells accounts for over 90% of cancer-specific mortality; however, the molecular mechanisms that govern tumor spread and distant recolonization remain unclear. 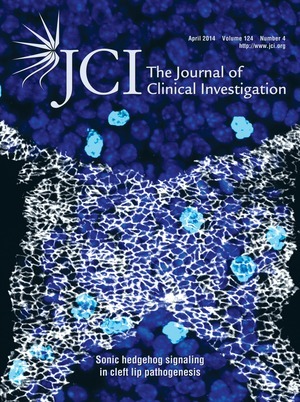 In this issue of JCI, Rokavec and colleagues shine light on this murky aspect of tumor biology by focusing through the lens of microenvironmental contributions, namely inflammation, as driving signals that set off a delicate, intracellular feedback loop among cytokine receptors, transcription factors and miRNAs. This study provides in vivo evidence and identifies molecular players behind the elusive switch that drives the epithelial-to-mesenchymal transition and the mesenchymal-to-epithelial transition. Citation Information: J Clin Invest. 2014;124(4):1460-1462. https://doi.org/10.1172/JCI75240. Genome-wide association studies (GWAS) have implicated SCN10A, which encodes a nociceptor-associated voltage-gated sodium channel subunit, as a modulator of cardiac conduction; however, this role has traditionally been ascribed to SCN5A, which is highly expressed in cardiac muscle. SCN10A is believed to affect cardiac conduction either directly through cardiomyocytes or indirectly via intracardiac neurons. In this issue of the JCI, van den Boogaard and colleagues introduce a third possibility: that the SCN10A locus acts as an enhancer of SCN5A gene expression. The authors demonstrate that SCN10A expression is negligible within human and murine hearts, and that a T-box enhancer within the SCN10A locus drives SCN5A expression within cardiomyocytes. This work reasserts SCN5A as the key determinant of cardiac conduction and highlights the importance of deciphering the functionality of coding versus noncoding regions when interpreting GWAS data. Citation Information: J Clin Invest. 2014;124(4):1462-1465. https://doi.org/10.1172/JCI75238. Thromboinflammatory diseases result from the interactions of vascular endothelial cells, inflammatory cells, and platelets with cellular adhesion molecules, plasma proteins, and lipids. Tipping the balance toward a prothrombotic, proinflammatory phenotype results from multicellular activation signals. In this issue of the JCI, Li et al. explore the regulation of heterotypic neutrophil-platelet contacts in response to TNF-α–induced venular inflammation with relevance to sickle cell disease (SCD). Citation Information: J Clin Invest. 2014;124(4):1465-1467. https://doi.org/10.1172/JCI75554. Recent studies have demonstrated that insulin stimulates bone cells to produce and activate osteocalcin, an endocrine hormone that increases the efficiency of glucose metabolism through its actions on the pancreas and other peripheral tissues. In this issue of the JCI, Wei and colleagues directly explore the contribution of insulin signaling in osteoblasts to the disturbances in whole-body glucose metabolism associated with a high-fat diet. In mice fed a high-fat diet, increased uptake of saturated fatty acids by the osteoblast accelerates the ubiquitination and degradation of the insulin receptor. In this setting, impairments in osteoblast insulin signaling reduce serum levels of undercarboxylated osteocalcin, which in turn exacerbate insulin resistance in muscle and white adipose tissue. These findings underscore the importance of insulin-responsive skeletal cells as components of a newly appreciated endocrine network critical for regulating global energy homeostasis. Citation Information: J Clin Invest. 2014;124(4):1468-1482. https://doi.org/10.1172/JCI70372. The recent identification of multiple dominant mutations in the gene encoding β-catenin in both humans and mice has enabled exploration of the molecular and cellular basis of β-catenin function in cognitive impairment. In humans, β-catenin mutations that cause a spectrum of neurodevelopmental disorders have been identified. We identified de novo β-catenin mutations in patients with intellectual disability, carefully characterized their phenotypes, and were able to define a recognizable intellectual disability syndrome. In parallel, characterization of a chemically mutagenized mouse line that displays features similar to those of human patients with β-catenin mutations enabled us to investigate the consequences of β-catenin dysfunction through development and into adulthood. The mouse mutant, designated batface (Bfc), carries a Thr653Lys substitution in the C-terminal armadillo repeat of β-catenin and displayed a reduced affinity for membrane-associated cadherins. In association with this decreased cadherin interaction, we found that the mutation results in decreased intrahemispheric connections, with deficits in dendritic branching, long-term potentiation, and cognitive function. Our study provides in vivo evidence that dominant mutations in β-catenin underlie losses in its adhesion-related functions, which leads to severe consequences, including intellectual disability, childhood hypotonia, progressive spasticity of lower limbs, and abnormal craniofacial features in adults. Citation Information: J Clin Invest. 2014;124(4):1483-1496. https://doi.org/10.1172/JCI72305. Interactions between platelets, leukocytes, and activated endothelial cells are important during microvascular occlusion; however, the regulatory mechanisms of these heterotypic cell-cell interactions remain unclear. Here, using intravital microscopy to evaluate mice lacking specific isoforms of the serine/threonine kinase AKT and bone marrow chimeras, we found that hematopoietic cell–associated AKT2 is important for neutrophil adhesion and crawling and neutrophil-platelet interactions on activated endothelial cells during TNF-α–induced venular inflammation. Studies with an AKT2-specific inhibitor and cells isolated from WT and Akt KO mice revealed that platelet- and neutrophil-associated AKT2 regulates heterotypic neutrophil-platelet aggregation under shear conditions. In particular, neutrophil AKT2 was critical for membrane translocation of αMβ2 integrin, β2-talin1 interaction, and intracellular Ca2+ mobilization. We found that the basal phosphorylation levels of AKT isoforms were markedly increased in neutrophils and platelets isolated from patients with sickle cell disease (SCD), an inherited hematological disorder associated with vascular inflammation and occlusion. AKT2 inhibition reduced heterotypic aggregation of neutrophils and platelets isolated from SCD patients and diminished neutrophil adhesion and neutrophil-platelet aggregation in SCD mice, thereby improving blood flow rates. Our results provide evidence that neutrophil AKT2 regulates αMβ2 integrin function and suggest that AKT2 is important for neutrophil recruitment and neutrophil-platelet interactions under thromboinflammatory conditions such as SCD. Citation Information: J Clin Invest. 2014;124(4):1497-1511. https://doi.org/10.1172/JCI67382. Tumor endothelial marker 1 (TEM1; also known as endosialin or CD248) is a protein found on tumor vasculature and in tumor stroma. Here, we tested whether TEM1 has potential as a therapeutic target for cancer immunotherapy by immunizing immunocompetent mice with Tem1 cDNA fused to the minimal domain of the C fragment of tetanus toxoid (referred to herein as Tem1-TT vaccine). Tem1-TT vaccination elicited CD8+ and/or CD4+ T cell responses against immunodominant TEM1 protein sequences. Prophylactic immunization of animals with Tem1-TT prevented or delayed tumor formation in several murine tumor models. Therapeutic vaccination of tumor-bearing mice reduced tumor vascularity, increased infiltration of CD3+ T cells into the tumor, and controlled progression of established tumors. Tem1-TT vaccination also elicited CD8+ cytotoxic T cell responses against murine tumor-specific antigens. Effective Tem1-TT vaccination did not affect angiogenesis-dependent physiological processes, including wound healing and reproduction. Based on these data and the widespread expression of TEM1 on the vasculature of different tumor types, we conclude that targeting TEM1 has therapeutic potential in cancer immunotherapy. Citation Information: J Clin Invest. 2014;124(4):1512-1524. https://doi.org/10.1172/JCI70921. Aberrant expression of the secreted protein, acidic, cysteine-rich (osteonectin) (SPARC) gene, which encodes a matricellular protein that participates in normal tissue remodeling, is associated with a variety of diseases including cancer, but the contribution of SPARC to malignant growth remains controversial. We previously reported that SPARC was among the most upregulated genes in cytogenetically normal acute myeloid leukemia (CN-AML) patients with gene-expression profiles predictive of unfavorable outcome, such as mutations in isocitrate dehydrogenase 2 (IDH2-R172) and overexpression of the oncogenes brain and acute leukemia, cytoplasmic (BAALC) and v-ets erythroblastosis virus E26 oncogene homolog (ERG). In contrast, SPARC was downregulated in CN-AML patients harboring mutations in nucleophosmin (NPM1) that are associated with favorable prognosis. Based on these observations, we hypothesized that SPARC expression is clinically relevant in AML. Here, we found that SPARC overexpression is associated with adverse outcome in CN-AML patients and promotes aggressive leukemia growth in murine models of AML. In leukemia cells, SPARC expression was mediated by the SP1/NF-κB transactivation complex. Furthermore, secreted SPARC activated the integrin-linked kinase/AKT (ILK/AKT) pathway, likely via integrin interaction, and subsequent β-catenin signaling, which is involved in leukemia cell self-renewal. Pharmacologic inhibition of the SP1/NF-κB complex resulted in SPARC downregulation and leukemia growth inhibition. Together, our data indicate that evaluation of SPARC expression has prognosticative value and SPARC is a potential therapeutic target for AML. Citation Information: J Clin Invest. 2014;124(4):1525-1536. https://doi.org/10.1172/JCI73455. Background. The therapeutic resistance of pancreatic ductal adenocarcinoma (PDAC) is partly ascribed to ineffective delivery of chemotherapy to cancer cells. We hypothesized that physical properties at vascular, extracellular, and cellular scales influence delivery of and response to gemcitabine-based therapy. Methods. We developed a method to measure mass transport properties during routine contrast-enhanced CT scans of individual human PDAC tumors. Additionally, we evaluated gemcitabine infusion during PDAC resection in 12 patients, measuring gemcitabine incorporation into tumor DNA and correlating its uptake with human equilibrative nucleoside transporter (hENT1) levels, stromal reaction, and CT-derived mass transport properties. We also studied associations between CT-derived transport properties and clinical outcomes in patients who received preoperative gemcitabine-based chemoradiotherapy for resectable PDAC. Results. Transport modeling of 176 CT scans illustrated striking differences in transport properties between normal pancreas and tumor, with a wide array of enhancement profiles. Reflecting the interpatient differences in contrast enhancement, resected tumors exhibited dramatic differences in gemcitabine DNA incorporation, despite similar intravascular pharmacokinetics. Gemcitabine incorporation into tumor DNA was inversely related to CT-derived transport parameters and PDAC stromal score, after accounting for hENT1 levels. Moreover, stromal score directly correlated with CT-derived parameters. Among 110 patients who received preoperative gemcitabine-based chemoradiotherapy, CT-derived parameters correlated with pathological response and survival. Conclusion. Gemcitabine incorporation into tumor DNA is highly variable and correlates with multiscale transport properties that can be derived from routine CT scans. Furthermore, pretherapy CT-derived properties correlate with clinically relevant endpoints. Funding. Lustgarten Foundation (989161), Department of Defense (W81XWH-09-1-0212), NIH (U54CA151668, KCA088084). Citation Information: J Clin Invest. 2014;124(4):1552-1567. https://doi.org/10.1172/JCI66407. Familial Alzheimer’s disease (FAD) is characterized by autosomal dominant heritability and early disease onset. Mutations in the gene encoding presenilin-1 (PS1) are found in approximately 80% of cases of FAD, with some of these patients presenting cerebellar damage with amyloid plaques and ataxia with unclear pathophysiology. A Colombian kindred carrying the PS1-E280A mutation is the largest known cohort of PS1-FAD patients. Here, we investigated PS1-E280A–associated cerebellar dysfunction and found that it occurs early in PS1-E208A carriers, while cerebellar signs are highly prevalent in patients with dementia. Postmortem analysis of cerebella of PS1-E280A carrier revealed greater Purkinje cell (PC) loss and more abnormal mitochondria compared with controls. In PS1-E280A tissue, ER/mitochondria tethering was impaired, Ca2+ channels IP3Rs and CACNA1A were downregulated, and Ca2+-dependent mitochondrial transport proteins MIRO1 and KIF5C were reduced. Accordingly, expression of PS1-E280A in a neuronal cell line altered ER/mitochondria tethering and transport compared with that in cells expressing wild-type PS1. In a murine model of PS1-FAD, animals exhibited mild ataxia and reduced PC simple spike activity prior to cerebellar β-amyloid deposition. Our data suggest that impaired calcium homeostasis and mitochondrial dysfunction in PS1-FAD PCs reduces their activity and contributes to motor coordination deficits prior to Aβ aggregation and dementia. We propose that PS1-E280A affects both Ca2+ homeostasis and Aβ precursor processing, leading to FAD and neurodegeneration. Citation Information: J Clin Invest. 2014;124(4):1568-1581. https://doi.org/10.1172/JCI70408. The use of pegylated interferon-α (pegIFN-α) has replaced unmodified recombinant IFN-α for the treatment of chronic viral hepatitis. While the superior antiviral efficacy of pegIFN-α is generally attributed to improved pharmacokinetic properties, the pharmacodynamic effects of pegIFN-α in the liver have not been studied. Here, we analyzed pegIFN-α–induced signaling and gene regulation in paired liver biopsies obtained prior to treatment and during the first week following pegIFN-α injection in 18 patients with chronic hepatitis C. Despite sustained high concentrations of pegIFN-α in serum, the Jak/STAT pathway was activated in hepatocytes only on the first day after pegIFN-α administration. Evaluation of liver biopsies revealed that pegIFN-α induces hundreds of genes that can be classified into four clusters based on different temporal expression profiles. In all clusters, gene transcription was mainly driven by IFN-stimulated gene factor 3 (ISGF3). Compared with conventional IFN-α therapy, pegIFN-α induced a broader spectrum of gene expression, including many genes involved in cellular immunity. IFN-induced secondary transcription factors did not result in additional waves of gene expression. Our data indicate that the superior antiviral efficacy of pegIFN-α is not the result of prolonged Jak/STAT pathway activation in hepatocytes, but rather is due to induction of additional genes that are involved in cellular immune responses. Citation Information: J Clin Invest. 2014;124(4):1582-1586. https://doi.org/10.1172/JCI72763. Targeted cancer therapies often induce “outlier” responses in molecularly defined patient subsets. One patient with advanced-stage lung adenocarcinoma, who was treated with oral sorafenib, demonstrated a near-complete clinical and radiographic remission for 5 years. Whole-genome sequencing and RNA sequencing of primary tumor and normal samples from this patient identified a somatic mutation, ARAF S214C, present in the cancer genome and expressed at high levels. Additional mutations affecting this residue of ARAF and a nearby residue in the related kinase RAF1 were demonstrated across 1% of an independent cohort of lung adenocarcinoma cases. The ARAF mutations were shown to transform immortalized human airway epithelial cells in a sorafenib-sensitive manner. These results suggest that mutant ARAF is an oncogenic driver in lung adenocarcinoma and an indicator of sorafenib response. Citation Information: J Clin Invest. 2014;124(4):1587-1597. https://doi.org/10.1172/JCI72829. Background. X-linked hypophosphatemia (XLH) is the most common heritable form of rickets and osteomalacia. XLH-associated mutations in phosphate-regulating endopeptidase (PHEX) result in elevated serum FGF23, decreased renal phosphate reabsorption, and low serum concentrations of phosphate (inorganic phosphorus, Pi) and 1,25-dihydroxyvitamin D [1,25(OH)2D]. KRN23 is a human anti-FGF23 antibody developed as a potential treatment for XLH. Here, we have assessed the safety, tolerability, pharmacokinetics (PK), pharmacodynamics (PD), and immunogenicity of KRN23 following a single i.v. or s.c. dose of KRN23 in adults with XLH. Methods. Thirty-eight XLH patients were randomized to receive a single dose of KRN23 (0.003–0.3 mg/kg i.v. or 0.1–1 mg/kg s.c.) or placebo. PK, PD, immunogenicity, safety, and tolerability were assessed for up to 50 days. Results. KRN23 significantly increased the maximum renal tubular threshold for phosphate reabsorption (TmP/GFR), serum Pi, and 1,25(OH)2D compared with that of placebo (P < 0.01). The maximum serum Pi concentration occurred later following s.c. dosing (8–15 days) compared with that seen with i.v. dosing (0.5–4 days). The effect duration was dose related and persisted longer in patients who received s.c. administration. Changes from baseline in TmP/GFR, serum Pi, and serum 1,25(OH)2D correlated with serum KRN23 concentrations. The mean t1/2 of KRN23 was 8–12 days after i.v. administration and 13–19 days after s.c. administration. Patients did not exhibit increased nephrocalcinosis or develop hypercalciuria, hypercalcemia, anti-KRN23 antibodies, or elevated serum parathyroid hormone (PTH) or creatinine. Conclusion. KRN23 increased TmP/GFR, serum Pi, and serum 1,25(OH)2D. The positive effect of KR23 on serum Pi and its favorable safety profile suggest utility for KRN23 in XLH patients. Funding. Kyowa Hakko Kirin Pharma, Inc.
Citation Information: J Clin Invest. 2014;124(4):1598-1607. https://doi.org/10.1172/JCI67621. Hereditary deafness affects approximately 1 in 2,000 children. Mutations in the gene encoding the cochlear gap junction protein connexin 26 (CX26) cause prelingual, nonsyndromic deafness and are responsible for as many as 50% of hereditary deafness cases in certain populations. Connexin-associated deafness is thought to be the result of defective development of auditory sensory epithelium due to connexion dysfunction. Surprisingly, CX26 deficiency is not compensated for by the closely related connexin CX30, which is abundantly expressed in the same cochlear cells. Here, using two mouse models of CX26-associated deafness, we demonstrate that disruption of the CX26-dependent gap junction plaque (GJP) is the earliest observable change during embryonic development of mice with connexin-associated deafness. Loss of CX26 resulted in a drastic reduction in the GJP area and protein level and was associated with excessive endocytosis with increased expression of caveolin 1 and caveolin 2. Furthermore, expression of deafness-associated CX26 and CX30 in cell culture resulted in visible disruption of GJPs and loss of function. Our results demonstrate that deafness-associated mutations in CX26 induce the macromolecular degradation of large gap junction complexes accompanied by an increase in caveolar structures. Citation Information: J Clin Invest. 2014;124(4):1608-1621. https://doi.org/10.1172/JCI71195. Focal segmental glomerular sclerosis (FSGS) is a primary kidney disease that is commonly associated with proteinuria and progressive loss of glomerular function, leading to development of chronic kidney disease (CKD). FSGS is characterized by podocyte injury and depletion and collapse of glomerular capillary segments. Progression of FSGS is associated with TGF-β activation in podocytes; however, it is not clear how TGF-β signaling promotes disease. Here, we determined that podocyte-specific activation of TGF-β signaling in transgenic mice and BALB/c mice with Adriamycin-induced glomerulosclerosis is associated with endothelin-1 (EDN1) release by podocytes, which mediates mitochondrial oxidative stress and dysfunction in adjacent endothelial cells via paracrine EDN1 receptor type A (EDNRA) activation. Endothelial dysfunction promoted podocyte apoptosis, and inhibition of EDNRA or scavenging of mitochondrial-targeted ROS prevented podocyte loss, albuminuria, glomerulosclerosis, and renal failure. We confirmed reciprocal crosstalk between podocytes and endothelial cells in a coculture system. Biopsies from patients with FSGS exhibited increased mitochondrial DNA damage, consistent with EDNRA-mediated glomerular endothelial mitochondrial oxidative stress. Our studies indicate that segmental glomerulosclerosis develops as a result of podocyte-endothelial crosstalk mediated by EDN1/EDNRA-dependent mitochondrial dysfunction and suggest that targeting the reciprocal interaction between podocytes and endothelia may provide opportunities for therapeutic intervention in FSGS. Citation Information: J Clin Invest. 2014;124(4):1622-1635. https://doi.org/10.1172/JCI71386. Pathological remodeling of the extracellular matrix (ECM) by fibroblasts leads to organ failure. Development of idiopathic pulmonary fibrosis (IPF) is characterized by a progressive fibrotic scarring in the lung that ultimately leads to asphyxiation; however, the cascade of events that promote IPF are not well defined. Here, we examined how the interplay between the ECM and fibroblasts affects both the transcriptome and translatome by culturing primary fibroblasts generated from IPF patient lung tissue or nonfibrotic lung tissue on decellularized lung ECM from either IPF or control patients. Surprisingly, the origin of the ECM had a greater impact on gene expression than did cell origin, and differences in translational control were more prominent than alterations in transcriptional regulation. Strikingly, genes that were translationally activated by IPF-derived ECM were enriched for those encoding ECM proteins detected in IPF tissue. We determined that genes encoding IPF-associated ECM proteins are targets for miR-29, which was downregulated in fibroblasts grown on IPF-derived ECM, and baseline expression of ECM targets could be restored by overexpression of miR-29. Our data support a model in which fibroblasts are activated to pathologically remodel the ECM in IPF via a positive feedback loop between fibroblasts and aberrant ECM. Interrupting this loop may be a strategy for IPF treatment. Citation Information: J Clin Invest. 2014;124(4):1636-1645. https://doi.org/10.1172/JCI71545. The transcription factor SOX2 is an essential regulator of pluripotent stem cells and promotes development and maintenance of squamous epithelia. We previously reported that SOX2 is an oncogene and subject to highly recurrent genomic amplification in squamous cell carcinomas (SCCs). Here, we have further characterized the function of SOX2 in SCC. Using ChIP-seq analysis, we compared SOX2-regulated gene profiles in multiple SCC cell lines to ES cell profiles and determined that SOX2 binds to distinct genomic loci in SCCs. In SCCs, SOX2 preferentially interacts with the transcription factor p63, as opposed to the transcription factor OCT4, which is the preferred SOX2 binding partner in ES cells. SOX2 and p63 exhibited overlapping genomic occupancy at a large number of loci in SCCs; however, coordinate binding of SOX2 and p63 was absent in ES cells. We further demonstrated that SOX2 and p63 jointly regulate gene expression, including the oncogene ETV4, which was essential for SOX2-amplified SCC cell survival. Together, these findings demonstrate that the action of SOX2 in SCC differs substantially from its role in pluripotency. The identification of the SCC-associated interaction between SOX2 and p63 will enable deeper characterization the downstream targets of this interaction in SCC and normal squamous epithelial physiology. Citation Information: J Clin Invest. 2014;124(4):1646-1659. https://doi.org/10.1172/JCI71812. Bone metastasis is a frequent complication of breast cancer that is often accelerated by TGF-β signaling; however, little is known about how the TGF-β pathway is regulated during bone metastasis. Here we report that deleted in liver cancer 1 (DLC1) is an important regulator of TGF-β responses and osteolytic metastasis of breast cancer cells. In murine models, breast cancer cells lacking DLC1 expression exhibited enhanced capabilities of bone metastasis. Knockdown of DLC1 in cancer cells promoted bone metastasis, leading to manifested osteolysis and accelerated death in mice, while DLC1 overexpression suppressed bone metastasis. Activation of Rho-ROCK signaling in the absence of DLC1 mediated SMAD3 linker region phosphorylation and TGF-β–induced expression of parathyroid hormone–like hormone (PTHLH), leading to osteoclast maturation for osteolytic colonization. Furthermore, pharmacological inhibition of Rho-ROCK effectively reduced PTHLH production and breast cancer bone metastasis in vitro and in vivo. Evaluation of clinical breast tumor samples revealed that reduced DLC1 expression was linked to elevated PTHLH expression and organ-specific metastasis to bone. Overall, our findings define a stroma-dependent paradigm of Rho signaling in cancer and implicate Rho–TGF-β crosstalk in osteolytic bone metastasis. Citation Information: J Clin Invest. 2014;124(4):1660-1671. https://doi.org/10.1172/JCI72688. Cleft lip, which results from impaired facial process growth and fusion, is one of the most common craniofacial birth defects. Many genes are known to be involved in the etiology of this disorder; however, our understanding of cleft lip pathogenesis remains incomplete. In the present study, we uncovered a role for sonic hedgehog (SHH) signaling during lip fusion. Mice carrying compound mutations in hedgehog acyltransferase (Hhat) and patched1 (Ptch1) exhibited perturbations in the SHH gradient during frontonasal development, which led to hypoplastic nasal process outgrowth, epithelial seam persistence, and cleft lip. Further investigation revealed that enhanced SHH signaling restricts canonical WNT signaling in the lambdoidal region by promoting expression of genes encoding WNT inhibitors. Moreover, reduction of canonical WNT signaling perturbed p63/interferon regulatory factor 6 (p63/IRF6) signaling, resulting in increased proliferation and decreased cell death, which was followed by persistence of the epithelial seam and cleft lip. Consistent with our results, mutations in genes that disrupt SHH and WNT signaling have been identified in both mice and humans with cleft lip. Collectively, our data illustrate that altered SHH signaling contributes to the etiology and pathogenesis of cleft lip through antagonistic interactions with other gene regulatory networks, including the canonical WNT and p63/IRF6 signaling pathways. Citation Information: J Clin Invest. 2014;124(4):1672-1684. https://doi.org/10.1172/JCI63139. The G1 kinase CDK4 is amplified or overexpressed in some human tumors and promotes tumorigenesis by inhibiting known tumor suppressors. Here, we report that CDK4 deficiency markedly accelerated lymphoma development in the Eμ-Myc transgenic mouse model of B lymphoma and that silencing or loss of CDK4 augmented the tumorigenic potential of Myc-driven mouse and human B cell lymphoma in transplant models. Accelerated disease in CDK4-deficient Eμ-Myc transgenic mice was associated with rampant genomic instability that was provoked by dysregulation of a FOXO1/RAG1/RAG2 pathway. Specifically, CDK4 phosphorylated and inactivated FOXO1, which prevented FOXO1-dependent induction of Rag1 and Rag2 transcription. CDK4-deficient Eμ-Myc B cells had high levels of the active form of FOXO1 and elevated RAG1 and RAG2. Furthermore, overexpression of RAG1 and RAG2 accelerated lymphoma development in a transplant model, with RAG1/2-expressing tumors exhibiting hallmarks of genomic instability. Evaluation of human tumor samples revealed that CDK4 expression was markedly suppressed, while FOXO1 expression was elevated, in several subtypes of human non-Hodgkin B cell lymphoma. Collectively, these findings establish a context-specific tumor suppressor function for CDK4 that prevents genomic instability, which contributes to B cell lymphoma. Furthermore, our data suggest that targeting CDK4 may increase the risk for the development and/or progression of lymphoma. Citation Information: J Clin Invest. 2014;124(4):1685-1698. https://doi.org/10.1172/JCI69780. Citation Information: J Clin Invest. 2014;124(4):1699-1710. https://doi.org/10.1172/JCI71520. Genetic studies have identified common variants within the intergenic region (HBS1L-MYB) between GTP-binding elongation factor HBS1L and myeloblastosis oncogene MYB on chromosome 6q that are associated with elevated fetal hemoglobin (HbF) levels and alterations of other clinically important human erythroid traits. It is unclear how these noncoding sequence variants affect multiple erythrocyte characteristics. Here, we determined that several HBS1L-MYB intergenic variants affect regulatory elements that are occupied by key erythroid transcription factors within this region. These elements interact with MYB, a critical regulator of erythroid development and HbF levels. We found that several HBS1L-MYB intergenic variants reduce transcription factor binding, affecting long-range interactions with MYB and MYB expression levels. These data provide a functional explanation for the genetic association of HBS1L-MYB intergenic polymorphisms with human erythroid traits and HbF levels. Our results further designate MYB as a target for therapeutic induction of HbF to ameliorate sickle cell and β-thalassemia disease severity. Citation Information: J Clin Invest. 2014;124(4):1711-1722. https://doi.org/10.1172/JCI72058. Citation Information: J Clin Invest. 2014;124(4):1723-1733. https://doi.org/10.1172/JCI66287. T cell depletion is commonly used in organ transplantation for immunosuppression; however, a restoration of T cell homeostasis following depletion leads to increased memory T cells, which may promote transplant rejection. The cytokine IL-7 is important for controlling lymphopoiesis under both normal and lymphopenic conditions. Here, we investigated whether blocking IL-7 signaling with a mAb that targets IL-7 receptor α (IL-7Rα) alone or following T cell depletion confers an advantage for allograft survival in murine transplant models. We found that IL-7R blockade alone induced indefinite pancreatic islet allograft survival if anti–IL-7R treatment was started 3 weeks before graft. IL-7R blockade following anti-CD4– and anti-CD8–mediated T cell depletion markedly prolonged skin allograft survival. Furthermore, IL-7 inhibition in combination with T cell depletion synergized with either CTLA-4Ig administration or suboptimal doses of tacrolimus to induce long-term skin graft acceptance in this stringent transplant model. Together, these therapies inhibited T cell reconstitution, decreased memory T cell numbers, increased the relative frequency of Tregs, and abrogated both cellular and humoral alloimmune responses. Our data suggest that IL-7R blockade following T cell depletion has potential as a robust, immunosuppressive therapy in transplantation. Citation Information: J Clin Invest. 2014;124(4):1745-1756. https://doi.org/10.1172/JCI44071. Citation Information: J Clin Invest. 2014;124(4):1757-1769. https://doi.org/10.1172/JCI67846. Injury to the specialized epithelial cells of the glomerulus (podocytes) underlies the pathogenesis of all forms of proteinuric kidney disease; however, the specific genetic changes that mediate podocyte dysfunction after injury are not fully understood. Here, we performed a large-scale insertional mutagenic screen of injury-resistant podocytes isolated from mice and found that increased expression of the gene Rap1gap, encoding a RAP1 activation inhibitor, ameliorated podocyte injury resistance. Furthermore, injured podocytes in murine models of disease and kidney biopsies from glomerulosclerosis patients exhibited increased RAP1GAP, resulting in diminished glomerular RAP1 activation. In mouse models, podocyte-specific inactivation of Rap1a and Rap1b induced massive glomerulosclerosis and premature death. Podocyte-specific Rap1a and Rap1b haploinsufficiency also resulted in severe podocyte damage, including features of podocyte detachment. Over-expression of RAP1GAP in cultured podocytes induced loss of activated β1 integrin, which was similarly observed in kidney biopsies from patients. Furthermore, preventing elevation of RAP1GAP levels in injured podocytes maintained β1 integrin–mediated adhesion and prevented cellular detachment. Taken together, our findings suggest that increased podocyte expression of RAP1GAP contributes directly to podocyte dysfunction by a mechanism that involves loss of RAP1-mediated activation of β1 integrin. Citation Information: J Clin Invest. 2014;124(4):1770-1780. https://doi.org/10.1172/JCI70085. Background. Enhanced sympathetic activity at the ventricular myocardium can destabilize repolarization, increasing the risk of death. Sympathetic activity is known to cluster in low-frequency bursts; therefore, we hypothesized that sympathetic activity induces periodic low-frequency changes of repolarization. We developed a technique to assess the sympathetic effect on repolarization and identified periodic components in the low-frequency spectral range (≤0.1 Hz), which we termed periodic repolarization dynamics (PRD). Methods. We investigated the physiological properties of PRD in multiple experimental studies, including a swine model of steady-state ventilation (n = 7) and human studies involving fixed atrial pacing (n = 10), passive head-up tilt testing (n = 11), low-intensity exercise testing (n = 11), and beta blockade (n = 10). We tested the prognostic power of PRD in 908 survivors of acute myocardial infarction (MI). Finally, we tested the predictive values of PRD and T-wave alternans (TWA) in 2,965 patients undergoing clinically indicated exercise testing. Results. PRD was not related to underlying respiratory activity (P < 0.001) or heart-rate variability (P = 0.002). Furthermore, PRD was enhanced by activation of the sympathetic nervous system, and pharmacological blockade of sympathetic nervous system activity suppressed PRD (P ≤ 0.005 for both). Increased PRD was the strongest single risk predictor of 5-year total mortality (hazard ratio 4.75, 95% CI 2.94–7.66; P < 0.001) after acute MI. In patients undergoing exercise testing, the predictive value of PRD was strong and complementary to that of TWA. Conclusion. We have described and identified low-frequency rhythmic modulations of repolarization that are associated with sympathetic activity. Increased PRD can be used as a predictor of mortality in survivors of acute MI and patients undergoing exercise testing. Funding. This study was funded by Angewandte Klinische Forschung, University of Tübingen (252-1-0). Citation Information: J Clin Invest. 2014;124(4):1781-1793. https://doi.org/10.1172/JCI72323. Insulin signaling in osteoblasts has been shown recently to contribute to whole-body glucose homeostasis in animals fed a normal diet; however, it is unknown whether bone contributes to the insulin resistance that develops in animals challenged by a high-fat diet (HFD). Here, we evaluated the consequences of osteoblast-specific overexpression of or loss of insulin receptor in HFD-fed mice. We determined that the severity of glucose intolerance and insulin resistance that mice develop when fed a HFD is in part a consequence of osteoblast-dependent insulin resistance. Insulin resistance in osteoblasts led to a decrease in circulating levels of the active form of osteocalcin, thereby decreasing insulin sensitivity in skeletal muscle. Insulin resistance developed in osteoblasts as the result of increased levels of free saturated fatty acids, which promote insulin receptor ubiquitination and subsequent degradation. Together, these results underscore the involvement of bone, among other tissues, in the disruption of whole-body glucose homeostasis resulting from a HFD and the involvement of insulin and osteocalcin cross-talk in glucose intolerance. Furthermore, our data indicate that insulin resistance develops in bone as the result of lipotoxicity-associated loss of insulin receptors. Citation Information: J Clin Invest. 2014;124(4):1794-1809. https://doi.org/10.1172/JCI69927. The genes encoding RAS family members are frequently mutated in juvenile myelomonocytic leukemia (JMML) and acute myeloid leukemia (AML). RAS proteins are difficult to target pharmacologically; therefore, targeting the downstream PI3K and RAF/MEK/ERK pathways represents a promising approach to treat RAS-addicted tumors. The p110α isoform of PI3K (encoded by Pik3ca) is an essential effector of oncogenic KRAS in murine lung tumors, but it is unknown whether p110α contributes to leukemia. To specifically examine the role of p110α in murine hematopoiesis and in leukemia, we conditionally deleted p110α in HSCs using the Cre-loxP system. Postnatal deletion of p110α resulted in mild anemia without affecting HSC self-renewal; however, deletion of p110α in mice with KRASG12D-associated JMML markedly delayed their death. Furthermore, the p110α-selective inhibitor BYL719 inhibited growth factor–independent KRASG12D BM colony formation and sensitized cells to a low dose of the MEK inhibitor MEK162. Furthermore, combined inhibition of p110α and MEK effectively reduced proliferation of RAS-mutated AML cell lines and disease in an AML murine xenograft model. Together, our data indicate that RAS-mutated myeloid leukemias are dependent on the PI3K isoform p110α, and combined pharmacologic inhibition of p110α and MEK could be an effective therapeutic strategy for JMML and AML. Citation Information: J Clin Invest. 2014;124(4):1810-1820. https://doi.org/10.1172/JCI65899. Alteration of the surface glycosylation pattern on malignant cells potentially affects tumor immunity by directly influencing interactions with glycan-binding proteins (lectins) on the surface of immunomodulatory cells. The sialic acid–binding Ig-like lectins Siglec-7 and -9 are MHC class I–independent inhibitory receptors on human NK cells that recognize sialic acid–containing carbohydrates. Here, we found that the presence of Siglec-9 defined a subset of cytotoxic NK cells with a mature phenotype and enhanced chemotactic potential. Interestingly, this Siglec-9+ NK cell population was reduced in the peripheral blood of cancer patients. Broad analysis of primary tumor samples revealed that ligands of Siglec-7 and -9 were expressed on human cancer cells of different histological types. Expression of Siglec-7 and -9 ligands was associated with susceptibility of NK cell–sensitive tumor cells and, unexpectedly, of presumably NK cell–resistant tumor cells to NK cell–mediated cytotoxicity. Together, these observations have direct implications for NK cell–based therapies and highlight the requirement to consider both MHC class I haplotype and tumor-specific glycosylation. Citation Information: J Clin Invest. 2014;124(4):1821-1834. https://doi.org/10.1172/JCI71318. The autosomal recessive neurodegenerative disease spinal muscular atrophy (SMA) results from low levels of survival motor neuron (SMN) protein; however, it is unclear how reduced SMN promotes SMA development. Here, we determined that ubiquitin-dependent pathways regulate neuromuscular pathology in SMA. Using mouse models of SMA, we observed widespread perturbations in ubiquitin homeostasis, including reduced levels of ubiquitin-like modifier activating enzyme 1 (UBA1). SMN physically interacted with UBA1 in neurons, and disruption of Uba1 mRNA splicing was observed in the spinal cords of SMA mice exhibiting disease symptoms. Pharmacological or genetic suppression of UBA1 was sufficient to recapitulate an SMA-like neuromuscular pathology in zebrafish, suggesting that UBA1 directly contributes to disease pathogenesis. Dysregulation of UBA1 and subsequent ubiquitination pathways led to β-catenin accumulation, and pharmacological inhibition of β-catenin robustly ameliorated neuromuscular pathology in zebrafish, Drosophila, and mouse models of SMA. UBA1-associated disruption of β-catenin was restricted to the neuromuscular system in SMA mice; therefore, pharmacological inhibition of β-catenin in these animals failed to prevent systemic pathology in peripheral tissues and organs, indicating fundamental molecular differences between neuromuscular and systemic SMA pathology. Our data indicate that SMA-associated reduction of UBA1 contributes to neuromuscular pathogenesis through disruption of ubiquitin homeostasis and subsequent β-catenin signaling, highlighting ubiquitin homeostasis and β-catenin as potential therapeutic targets for SMA. Citation Information: J Clin Invest. 2014;124(4):1835-1843. https://doi.org/10.1172/JCI73441. Broadly HIV-1–neutralizing antibodies (BnAbs) display one or more unusual traits, including a long heavy chain complementarity-determining region 3 (HCDR3), polyreactivity, and high levels of somatic mutations. These shared characteristics suggest that BnAb development might be limited by immune tolerance controls. It has been postulated that HIV-1–infected individuals with autoimmune disease and defective immune tolerance mechanisms may produce BnAbs more readily than those without autoimmune diseases. In this study, we identified an HIV-1–infected individual with SLE who exhibited controlled viral load (<5,000 copies/ml) in the absence of controlling HLA phenotypes and developed plasma HIV-1 neutralization breadth. We collected memory B cells from this individual and isolated a BnAb, CH98, that targets the CD4 binding site (CD4bs) of HIV-1 envelope glycoprotein 120 (gp120). CH98 bound to human antigens including dsDNA, which is specifically associated with SLE. Anti-dsDNA reactivity was also present in the patient’s plasma. CH98 had a mutation frequency of 25% and 15% nt somatic mutations in the heavy and light chain variable domains, respectively, a long HCDR3, and a deletion in the light chain CDR1. The occurrence of anti-dsDNA reactivity by a HIV-1 CD4bs BnAb in an individual with SLE raises the possibility that some BnAbs and SLE-associated autoantibodies arise from similar pools of B cells. Citation Information: J Clin Invest. 2014;124(4):1844-1852. https://doi.org/10.1172/JCI73140. Variants in SCN10A, which encodes a voltage-gated sodium channel, are associated with alterations of cardiac conduction parameters and the cardiac rhythm disorder Brugada syndrome; however, it is unclear how SCN10A variants promote dysfunctional cardiac conduction. Here we showed by high-resolution 4C-seq analysis of the Scn10a-Scn5a locus in murine heart tissue that a cardiac enhancer located in Scn10a, encompassing SCN10A functional variant rs6801957, interacts with the promoter of Scn5a, a sodium channel–encoding gene that is critical for cardiac conduction. We observed that SCN5A transcript levels were several orders of magnitude higher than SCN10A transcript levels in both adult human and mouse heart tissue. Analysis of BAC transgenic mouse strains harboring an engineered deletion of the enhancer within Scn10a revealed that the enhancer was essential for Scn5a expression in cardiac tissue. Furthermore, the common SCN10A variant rs6801957 modulated Scn5a expression in the heart. In humans, the SCN10A variant rs6801957, which correlated with slowed conduction, was associated with reduced SCN5A expression. These observations establish a genomic mechanism for how a common genetic variation at SCN10A influences cardiac physiology and predisposes to arrhythmia. Citation Information: J Clin Invest. 2014;124(4):1853-1867. https://doi.org/10.1172/JCI73531. Members of the miR-34 family are induced by the tumor suppressor p53 and are known to inhibit epithelial-to-mesenchymal transition (EMT) and therefore presumably suppress the early phases of metastasis. Here, we determined that exposure of human colorectal cancer (CRC) cells to the cytokine IL-6 activates the oncogenic STAT3 transcription factor, which directly represses the MIR34A gene via a conserved STAT3-binding site in the first intron. Repression of MIR34A was required for IL-6–induced EMT and invasion. Furthermore, we identified the IL-6 receptor (IL-6R), which mediates IL-6–dependent STAT3 activation, as a conserved, direct miR-34a target. The resulting IL-6R/STAT3/miR-34a feedback loop was present in primary colorectal tumors as well as CRC, breast, and prostate cancer cell lines and associated with a mesenchymal phenotype. An active IL-6R/STAT3/miR-34a loop was necessary for EMT, invasion, and metastasis of CRC cell lines and was associated with nodal and distant metastasis in CRC patient samples. p53 activation in CRC cells interfered with IL-6–induced invasion and migration via miR-34a–dependent downregulation of IL6R expression. In Mir34a-deficient mice, colitis-associated intestinal tumors displayed upregulation of p-STAT3, IL-6R, and SNAIL and progressed to invasive carcinomas, which was not observed in WT animals. Collectively, our data indicate that p53-dependent expression of miR-34a suppresses tumor progression by inhibiting a IL-6R/STAT3/miR-34a feedback loop. Citation Information: J Clin Invest. 2014;124(4):1868-1868. https://doi.org/10.1172/JCI75669. Citation Information: J Clin Invest. 2014;124(4):1869-1869. https://doi.org/10.1172/JCI75675. Citation Information: J Clin Invest. 2014;124(4):1869-1869. https://doi.org/10.1172/JCI75776. Citation Information: J Clin Invest. 2014;124(4):1868-1868. https://doi.org/10.1172/JCI75754.